GORGEOUS VIEWS!! The ultimate family or couples beach vacation home base, this spacious single level home is seconds from the sand and the pristine Pacific. Stroll from the lanai to the surf line among dunes covered with native shrubs and grasses and a small state-owned sanctuary for our endangered Hawaiian Green Sea Turtles and native birds, and then along the coastline for shell gathering, and whale-watching (in season). Hear the lapping waves at night, and feel the trades off the water in the afternoons. A small stretch of sandy beach directly in front of the home is largely unknown to our island's visitors, making it a special place to experience seasonal whale-watching, sun-drenched lounging, and spectacular day's end sunsets. Enjoy stunning views from the large, open living area, dining area and master bedroom with ocean-facing walk-out sliders equipped with solar shades. Remodeled from the ground up in 2007, and well-maintained, this home is set up to seamlessly host indoor and outdoor living. A gracious kitchen is equipped with every necessity. The bedrooms are nicely separated, and are all en-suite. Décor was hand selected on Bali and from other south seas destinations in tasteful island style. Every convenience, including central AC, cable, WiFi, washer/dryer, Weber gas BBQ grill, and plenty of beach equipment including comfortable Tommy Bahama beach chairs. Master Bedroom has King with tub and shower and double sinks. Bedroom two: 2 Queens. Bedroom 3: Full and oversized twin. Sorry, absolutely no wedding parties or other large gatherings, per our permit. Hawaii Tax ID No. W22298820-01. This property is located on a gorgeous stretch of coastline , in one of the most desirable neighborhoods in south Maui. The views are spectacular. There are many activities and plenty of shopping and dining options within easy walking distance. The interior of the home is spacious and tastefully decorated, with all the comforts of home. Wonderful location to view whales in the winter months. Spectacular sunsets every night. Perfect for tropical photography with swaying palm trees. Nearby Hawaiian green sea turtle nesting site. Launch kayaks right from shore. Large lanai area for dining, relaxing and enjoying the views. Commanding ocean views throughout home. Information about luaus, water sports, etc available on request. Great house. Easy, 30 second walk to a quiet beach. Beautiful view from kitchen, dining, living and master bedroom. We stayed at this house for 10 days with our elementary school daughters. The location was great and the beach access was fantastic. The house had all the supplies we needed and we would definitely stay here again. Thank you for your review and I am so glad you enjoyed your stay. We look forward to having you again in the future! Had a Great Time Here Again! Thank you for your review! We are so glad you enjoyed your stay and the special magic of Maui again :-) We'll look forward to seeing you again in the future. Aloha! This property is amazing. It has a very natural habitat that attracts turtle activity. The whales were seen breaching right in front of the property. As with any property there were a couple issues with appliances however the property manager Sherry was amazing! She handled everything with over and above what would have been expected. She was responsive and polite in every communication. Even when an item was left behind she worked with us to get it to the proper owner. Just an amazing stay on an amazing property. Thank you so much for your review! We are so happy you enjoyed your stay. It was a pleasure having you and hope you come stay with us again in the future. Aloha! What a fabulous home! We spent a spectacular week here with our two adult children and their spouses. We started every morning with coffee on the lanai watching the whales (bring binoculars and/or a spotting scope to see them up close) and ended each day with cocktails watching whales and the unbelievably beautiful sunsets. We’ve been to Maui many times but this is the best vacation rental yet. The beach is just a few steps away and you’re close to so many great local restaurants and shopping. It was so nice to have the basics (paper products, seasonings and snacks) stocked and it’s close to two supermarkets. The open living area was wonderful to spend time together and the bedrooms are large and comfortable. It was awesome to have beach towels, coolers and chairs available. Sherry was great to work with and checking in and out was a breeze. For those complaining about the landscaping, there is a sign on the beach access path noting that it is a dune sanctuary. Not everything needs to be perfectly manicured to be beautiful. We will agree, however, that the dining room chairs have seen better days and have significant sinkholes. It really was a perfect week and we were all very sad to leave paradise. Maui No Ka Oi! Mahalo for your review! Thank you for your appreciation of the natural dune landscape which is necessary for maintaining native bird and turtle habitat. We have replaced the dining set with a beautiful new table and 8 comfy new chairs. Mahalo for your feedback and hope to see you again in the future. Aloha! Beautiful Beach House with awesome sunsets! My husband and I, with our children and grandchildren had a wonderful time at this centrally located beach house. In addition to the lovely ocean view, the house had a very private setting. The interior was very clean with a great layout! The house included a nice Weber propane grill which we used frequently, several beach chairs which were useful for our beach excursions, and nice furnishings, except for the dining room chairs that need to have the seats replaced. The kitchen appliances were good and there was plenty of cabinet and drawer space. There were also plenty of dishes and glasses provided. Access to the beach was easy, and every evening we saw sea turtles come on the beach to spend the night. The bathroom and beach towels that were provided were plentiful and of good quality. If you want to stay in a nice homey, private place instead of a commmercial resort, this place is for you. Located right on the ocean in one of South Maui's most exclusive neighborhoods, this home was designed to embrace the island's beach culture in a private setting that brings to mind Old Hawaii. Swaying coconut palms, beautiful flowering native shrubs, expansive ocean views, tropical breezes, and the sound of the lapping surf at night: this home is the perfect base for the ultimate family or couples vacation. 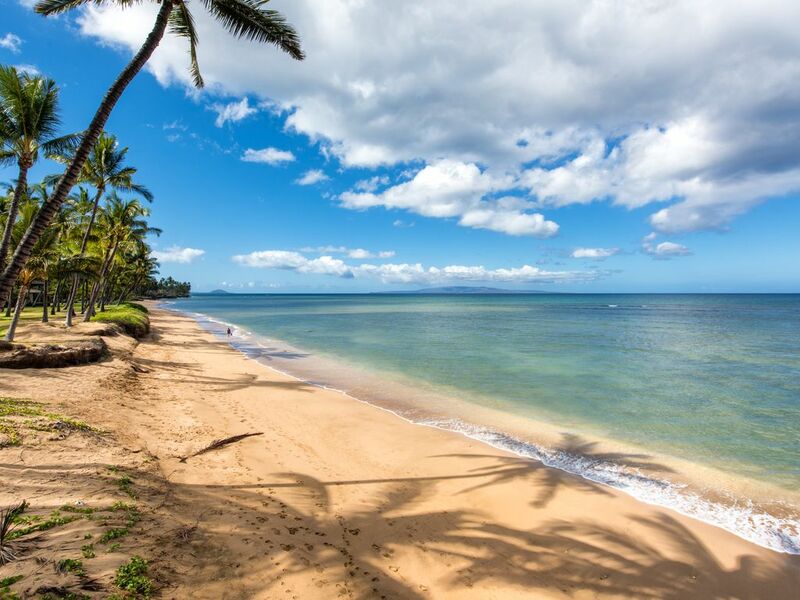 Just a few blocks from the heart of Kihei's beach culture, and the world class Kamaole beaches. Lovely "Hidden Beach," known for its lack of foot traffic, fronts this amazing property. Beyond the back yard you will find a state-owned sanctuary, where our protected Hawaiian Green Sea Turtles come to nest and nap on the sun-drenched dunes. Starbucks, Kihei Library, Foodland, and a dozen restaurants are within 5 blocks. Surf South Maui's surf break (The Cove) just a few blocks south at beautiful Kalama Beach Park. Snorkel some of the most beautiful reef in the island, and sunbathe on South Maui's amazing postcard beaches...all just a short walk away. Paddleboard and kayak right from there (or rent gear/take lessons a few blocks away). Seven minutes from Wailea. Rates and fees are subject to change until reservation is confirmed. Hawaii Accommodation Tax rate will increase by 1% to 14.42% beginning Jan 1, 2018. Any future guest booking made for dates between Nov 1, 2017 and Jan 1, 2018 that paid 14.42% in tax will receive a 1% refund after final balance is paid.